This barn is featured in the Taunton Press book Building a Shed by Joseph Truini. Cedar siding and trim with an extended overhang and one double door on the gable end. There are two 4’ x 2’ sash windows on one long side and a transom window above the gable end doors. 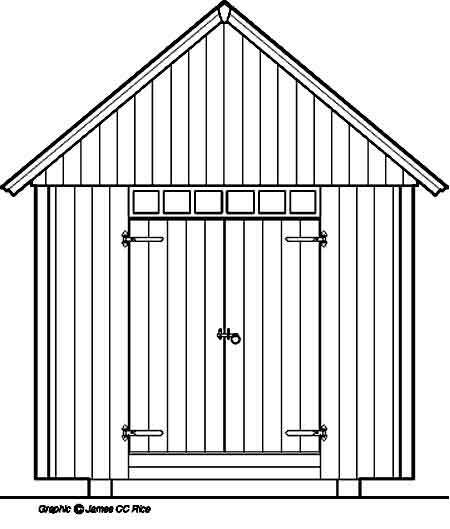 Our barn and shed plans guide you through the building process. They consist of drawings with dimensions and there is a materials list included for each plan. Printed on heavy paper ranging in size from 20” x 25” to 24” x 36” flat, they are folded like a road map to ship out in an envelope to you. We do not have building support and unfortunately cannot help you with your building project. Be sure you have professional help or a friend or family member with building experience to go to for advice and consultation before and during the project. Our barns, plans and hardware have been featured on TV shows, magazine articles and many books. 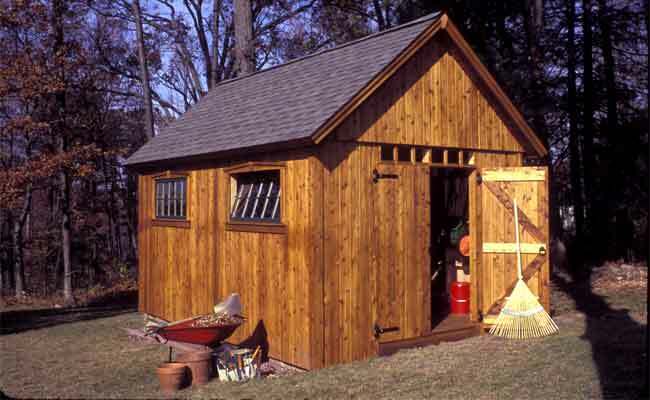 We have been in all of the Taunton Presses “Building a Shed” books, Better Homes and Gardens magazine and their book Sheds and Gazebos, several Popular Mechanics magazine covers and articles, Today's Homeowner, Mother Earth News, and lately a Fine Woodworking magazine. Several of our plans & sliding door hardware are in the latest version of Joseph Truini’s expert building books, this one called “Building Sheds”. See below for more info and to order. Please order online, call us with credit card information or send a check. There is state sales tax only if you are in Connecticut. For info on shipping outside the US please email us. FREE SHIPPING in the USA! We're sorry, international shipping is currently not available. We only ship in the US and Canada. We'd be happy to answer any questions you might have about our plans.